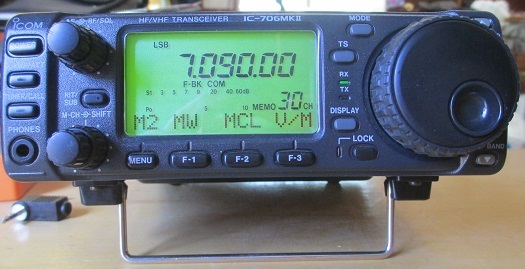 Here’s a look at the radio equipment I’ve been using for my recent SOTA activities. 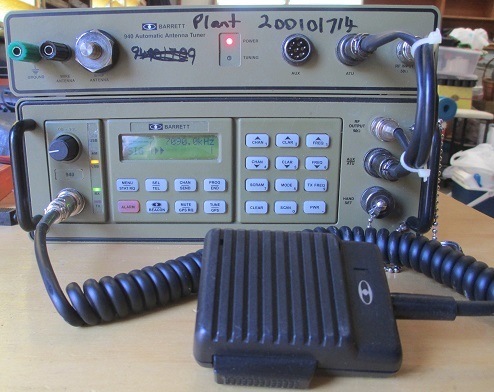 This is a commercial/military HF portable radio that is now showing its age a little, but is still perfectly capable of providing excellent performance on all HF bands between 1.6 and 30MHz. It comes with a fully automatic antenna tuner capable of matching just about anything from the proverbial “bit of wet string” to a long, long wire and anything in between. This radio is freely programmable via its front panel, or at least it is now that I’ve got the programming software working and have removed the locks! The downside is that it’s quite a big piece of equipment, fully occupying all the space in the backpack, and with a set of two 9AH Sealed Lead Acid Batteries it weighs in at around 11kg. It produces about 20W PEP (downhill with a following wind) which is more than adequate for SOTA work in most cases. 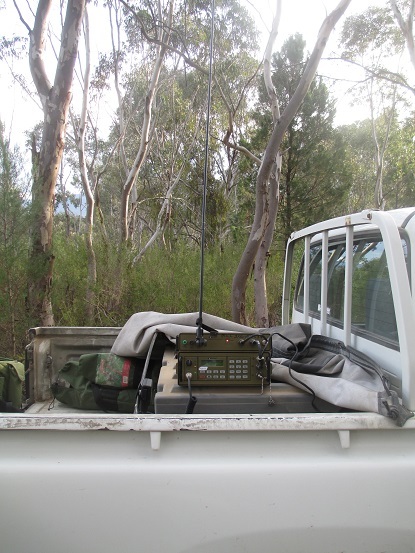 Here’s a couple of pictures of the Barrett 940 set up in the back of the trusty Hilux. 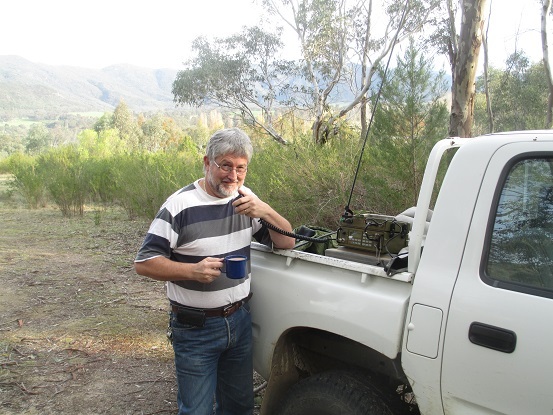 In these pics I’m using the Barrett 940 with its 10-foot whip antenna to make some contacts on 7MHz. I’m also, as you can see, multi-tasking by enjoying a cup of tea at the same time. There’s a bit more information on the Barrett 940 here. 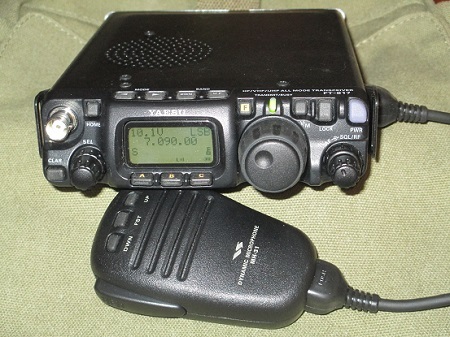 This radio is a little smaller and lighter than the Barrett 940 and consequently is much more portable, but it suffers from a major drawback in that it wasn’t really intended for use on battery power. It draws 1.6A on receive, which very quickly drains the SLABs even when running two of them in parallel. This little radio is an amazing piece of kit. I’ll probably be showing my age when I say that every time I take it out I’m impressed by how much they have managed to cram into that little box. 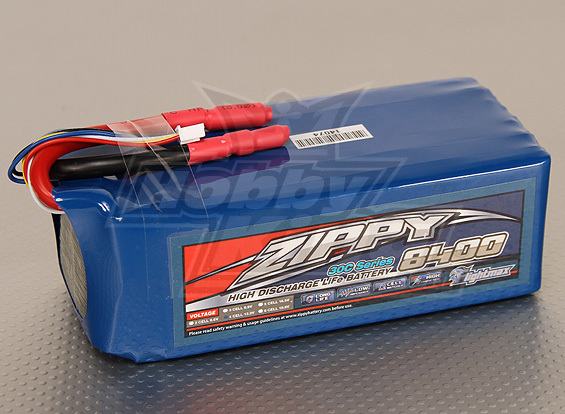 It’s small, light, draws relatively little power from the batteries and yet produces a good 5W output. It’s no wonder that you hear so many SOTA operators out there using these radios. Since acquiring my FT817 the other two radios haven’t had much air time! This is the latest addition to my SOTA kit. The battery is considerably lighter than the 9AH SLAB that it replaces, which is much appreciated when taking the gear out in the bush. Its capacity is way more than the FT817 requires, but I have plans to give it a run with the Barrett 940 as well.